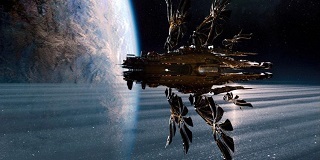 A visually extravagant but narratively muddled space opera from Matrix filmmakers the Wachowskis, Jupiter Ascending stars Mila Kunis as a seemingly lowly Chicago cleaner who discovers she is in fact heir to a powerful intergalactic dynasty. Tired of her working life spent cleaning toilets, Jupiter Jones is then informed by human/wolf bounty hunter Caine (Channing Tatum) that she's heir to the throne of the Abrasax family, an extraterrestrial race who were actually responsible for 'seeding' humanity. Not only that – Jupiter stands to inherit the Earth, something puts her in the firing line of ruthless Abrasax Prince Balem (Eddie Redmayne) who wants to secure his tyrannical rule by removing Jupiter from the equation. 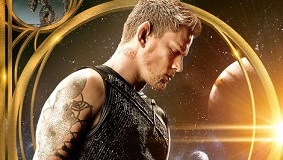 Whisking the audience from Earth across the galaxy to a variety of outrageously gaudy planets (with an homage to Terry Gilliam's classic Brazil thrown in for good measure), there's no denying that Jupiter Ascending is complete nonsense. Thankfully the cast, which also includes Brits Sean Bean and Douglas Booth, appear to be in on the joke, none more so than Redmayne whose mincing performance as the chief baddie is amusingly over-the-top. Someone who seemed to miss the memo emphasising the film's campy tone was composer Michael Giacchino, with whom the Wachowskis worked on 2008's Speed Racer and whose energetic, sweeping score frankly belongs in a much better movie. For all their storytelling flaws, the Wachowskis clearly encourage a sense of creativity in their film music, as their avant-garde collaborations with Don Davis on the Matrix trilogy demonstrate. 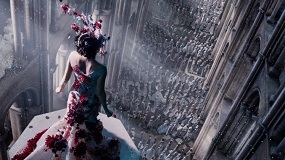 When it came to the music for Jupiter Ascending, the siblings took a cue from their co-director on 2011's Cloud Atlas, Tom Tykwer, and allowed Giacchino to write a substantial portion of the score before shooting was completed. This meant the composer based his fundamental musical ideas on a reading of the script rather than a viewing of the visuals. This isn't an altogether unusual move: Ennio Morricone wrote his music for Sergio Leone's Spaghetti Westerns before filming, with the music often played back on set to influence the rhythms of a particular scene. Nevertheless, it's pleasing and satisfying to see a composer being granted such creative freedom in an age where film scores are subject to a bewildering level of scrutiny. As further evidence of the mammoth 2-CD score's grandiose intentions, it actually opens with a series of four "Movements", bold musical statements of the various themes and motifs and not something that's routinely found in today's blockbuster scores. The first introduces Jupiter's theme: a heroic, brassy, three note statement that soon settles into a lilting, haunting choral elegy. Also of note is the wavering, graceful string solo at the beginning of the second, a track based around the Jupiter/Caine love theme that quickly gains sweeping gravitas through the full orchestra and gentle choir. The third is the imposing theme for the Abrasax family, a portentous, doom-laden inversion of Jupiter's three-note theme that emphasises the genetic ancestry between our heroine and the villains. And the fourth movement is an overture of sorts to the movie's brutally energetic action music, hinting at the material to come. The Abrasax theme then takes centre stage in the following tracks "The Houses of Abrasax", "Scrambled Eggs" and "I Hate My Life", reinstating the villains theme with plenty of full-blooded string runs, brass and chanting choir. The latter also cleverly integrates Jupiter's theme, contrasting, via a sprightly woodwind section, the relative frivolity of her Earth-bound life versus the impending threat of her outer space family. Surprisingly, Jupiter's theme initially takes something of a backseat, coming into its own later on as Kunis' character embraces her intergalactic destiny. Nevertheless, its malleability and relatively simple three note construction means it subtly underpins a lot of the material. The hugely impressive "The Abrasax Family Tree" in many ways demonstrates Giacchino's intelligent musical construction and also his myriad influences, moving from thunderous, brassy statements to a deeply menacing male voice choir that evokes memories of John Williams' Emperor theme from third Star Wars movie, Return of the Jedi. Williams' music (in particular his recent, more modernistic Star Wars scores) is unsurprisingly a huge influence, as it has been over most of Giacchino's career, and there are also overtones of innumerable other space opera soundtracks from the multi-faceted Star Trek franchise to Bill Conti's Masters of the Universe. However, Giacchino's own musical voice has now matured and developed to the extent that Jupiter Ascending is easily identifiable as his own work. "Shadow Chase" is the score's first proper explosion of exciting, relentless action music, Giacchino building on the aggression heard in previous scores such as Star Trek, John Carter and Mission: Impossible. 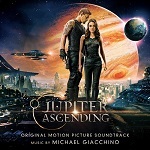 Where Jupiter Ascending really benefits is in its richly dynamic recording quality: earlier Giacchino scores have often been stymied by a dry recording that made his music seem 'smaller' in its soundscape than it was. However, there's no such problem here, the various nuances and textures of the music conveyed with enjoyable clarity, the Jerry Goldsmith-esque horns (plus choral outbursts) around the 4:30 mark a notable example. Given this overwhelming assault, Giacchino then calms things down for a few minutes. "The Titus Clipper" takes its cue from another film music master, John Barry, with its graceful Out of Africa-style strings and gentle tribal percussion. Even so, it doesn't stay placid for long, building into a soaring choral statement before that too dissolves into a lovely string solo towards the end. "Mutiny on the Bounty Hunter" (possibly the best of Giacchino's typically jokey track titles) ushers in more pounding action music, the brass players pushed to their limits with some complex woodwind arrangements also thrown in for good measure. "One Reincarnation Under God" begins with soaring, Goldsmith-esque choral work, continues with plaintive strings and resolves with another punchy rendition of the Abrasax theme to round off the first CD of the soundtrack. At the halfway point of Giacchino's opus, "Digging Up the Flirt" reinstates the attractive love theme for Jupiter and Caine, the piano/harp arrangement midway through especially effective. Jupiter's theme then gets a stirring workout in "A Wedding Darker", moving from noble strings to ethereal chimes as she grapples with a potential marriage to scheming Abrasax heir Titus (Douglas Booth). "Regenex is People!" continues in much the same vein, beginning with a lovely oboe solo and then passing the melody onto strings and soft choir before the insidious menace of the Abrasax theme steadily makes its presence felt. "The Lies Have It" is another frantic piece of ostinato-led action with blasts of the Abrasax and love themes before another lengthy piece of dynamic music gets underway in "It's a Hellava Chase". In these extended pieces, Giacchino really demonstrates his mastery of the orchestra, ensuring that the more subtle textures like tinkling chimes, trilling woodwinds and piping vocals aren't lost alongside the full-blown assaults from both the brass and choir. One senses that Giacchino is taking a leaf from James Horner and John Williams, fashioning pieces of music that hit a dizzying number of cue points whilst capturing a multitude of different emotions from fevered anticipation to shock and awe. It's genuinely stirring stuff. The brief "Dinosaur to New Heights" (at 59 seconds, the shortest track on the album) is an entrée to the action-packed conclusion of the score. "Family Jeopardy" utilises rhythmic strings and brass to build a sense of impending catastrophe in a manner evoking Jerry Goldsmith's Star Trek scores, before the multi-faceted choral work (ranging from low drones to staccato outbursts) takes over. Here is where Jupiter's theme makes its most pronounced appearance so far: a defiant statement of intent from the orchestra and vocals as she begins the fight back against her villainous alien family. Jupiter's theme opens "Abdicate This!" on glacial vocals, making further dynamic and fulsome statements alongside the love theme. Everything then explodes with an aggressively strident passage of action material, featuring ragged horn passages and pounding anvils a la Elliot Goldenthal. As ever, the Abrasax theme is never far away, Giacchino continually weaving his three primary ideas around one another as the score reaches its furious conclusion. The abrasive woodwinds and honking brass effects that open "Flying Dinosaur Flight" are reminiscent of Giacchino's more intense work on Lost, interwoven with which are a multitude of percussion and xylophones, the brass section gradually escalating in intensity and anchored by the steadfast presence of Jupiter's theme. Everything is then resolved in the lengthy "Commitment", which runs the full gamut of textures and emotions. Quiet harp, strings and vibraphone lead the first three minutes in a soothing rendition of the love theme, one that's soon picked up by a haunting cello solo. Brass and chanting choir representing the Abrasax theme then comes into full force, with the middle section of the track given over to the score's more avant-garde textures. However, the real highlight comes towards the end with a soprano vocal performance of Jupiter's theme underpinned by a host of snare drums and eventually picked up by the majesty of the entire choir. Everything then reaches a cacophonous, frenetic conclusion although, strangely, one lacking any overt statement of the principal themes, one of the score's few missteps. A variation on one of the earlier tracks "Flying Dinosaur Fight with Guts" then rounds everything off. 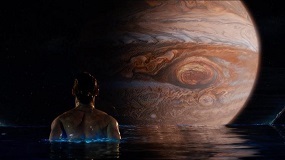 In terms of its sheer scope, complexity and ambition, Jupiter Ascending must rank as one of Michael Giacchino's most impressive soundtrack achievements to date. As ever, the composer gloriously resurrects the sound of innumerable classic film scores, from Star Wars to Star Trek and beyond. The two-CD presentation helps enormously in this regard: there's plenty of room for Giacchino's musical ideas to breath, although it does take multiple listens to tease the themes out. One could be forgiven for thinking that Jupiter's theme, for example, doesn't appear often enough, but this would do a disservice to the complexity of Giacchino's approach. However, where this score wins out over previous efforts like John Carter is in its vastly improved recording quality and more powerful, memorable themes. Although Giacchino has become popular for his nostalgic celebration of masters like John Williams and Jerry Goldsmith, on occasion his musical ideas have lacked the memorability to guarantee his scores classic status. No such problem here: the choral pieces soar, the action passages are truly exciting and the intimate moments are genuinely tender and appealing. All of the primary ideas circulate around on another in stimulating ways, building a vast operatic tapestry of music that has one foot in the traditions of the past and the other in those of the present. The application of the score in the film itself is somewhat more problematic. It's already loud enough on its own terms and the addition of the score could perhaps be seen as over-egging the pudding. Perhaps it's best to disassociate the score from the movie altogether, and simply appreciate the album as a stand-alone Michael Giacchino symphony. Taken simply on those terms, it's spectacular. The soundtrack album is available from these links at Amazon.com and Amazon.co.uk.